The second edition of ROAR!, a weekly race preview magazine from A.E. Engine, is now available. Fans can click here to see the latest issue. If you are new to ROAR!, please take a minute to signup to receive this 36 times during the 2013 season for free! RECEIVE ALL 36 EDITIONS IN YOUR MAILBOX FOR FREE! 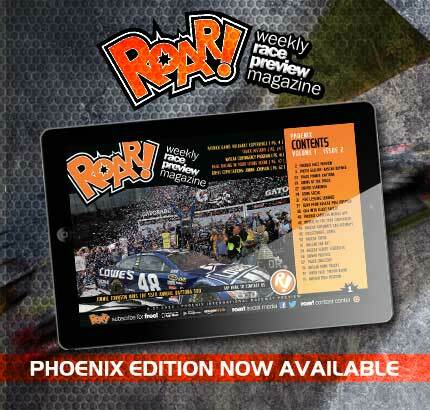 For fans that want to receive all 36 editions, they must sign up at www.polepositionmag.com/roar. A lifetime subscription is free, and we only require your email address. If you own a tablet or mobile device, don’t forget to download our free app. or click on this link https://play.google.com/store/apps/details?id=com.texterity.android.Roar&feature=search_result#?t=W251bGwsMSwyLDEsImNvbS50ZXh0ZXJpdHkuYW5kcm9pZC5Sb2FyIl0.